Traveling up Peachtree Street in Midtown, on the way to Buckhead from Downtown, if you happen to glance to your left at 12th Street, you'll see a bright red, green, and gold train! No, it's not an over-sized tree ornament for a gargantuan Christmas Tree, it's a life-size model of the first steam-powered locomotive built in the United States to establish regularly scheduled passenger service...meaning, this is an historically significant train. 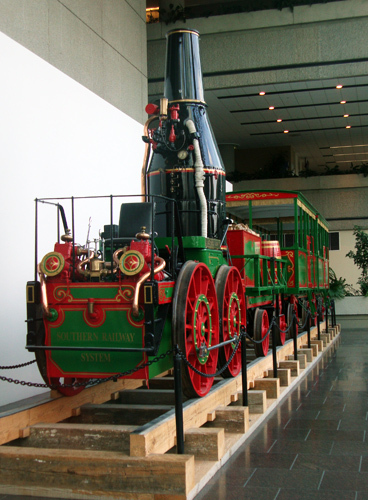 Housed in Norfolk Southern's Atlanta office, featuring floor to ceiling windows for easy viewing, the "Best Friend of Charleston," a replica of the 1830 original, is a fully operable train. The original Best Friend suffered a boiler explosion, the first in the U.S. to do so. The surviving parts were used to build the "Phoenix," well before the phoenix became Atlanta's mascot. Norfolk Southern's Midtown office is in the David R. Goode Building, named so for the retired Chairman, President, and CEO of Norfolk Southern Corporation.